As you might expect the facts are disputed. Moscow accuses Ankara of a treacherous attack. 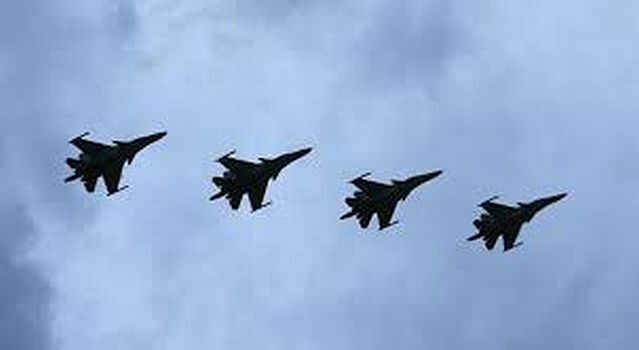 Ankara replies that the Russian fighter, after repeated warnings, remained in Turkish air space and violated Turkey’s sovereignty, but this is irrelevant, given that the Turkish President himself gave the order to down the plane so triggering an international crisis. After signing a historic accord with Putin to build the Turkish Stream which would have brought capital to Turkey and increased its prestige as the oil hub of the Mediterranean, why has Erdogan put the whole thing at risk? Why trigger an international crisis whose outcome is uncertain and which promises nothing positive on the military front or in terms of easing existing imperialist tensions. We can identify a number of threads. Russia’s military intervention in Syria has certainly upset the previous balance of power and is creating a new one which the Erdogan Government perceives as a threat to its role in the area. It represents an obstacle to be removed immediately, even – if necessary – by the use of force and with the risk of making an already dangerous situation even worse. Russia certainly did not decide to intervene so forcefully in order to punish the jihadi terrorists who destroyed its airliner in the Sinai with more than two hundred civilian victims. Rather Russia is looking to save its ally Bashar al Assad and thus preserve its military viability in the Mediterranean which otherwise would be lost. The struggle against IS is just an excuse. The real objective is to bombard the military bases of the adversaries of its ally. The area pinpointed is on the border with Turkey, with a Turkmen population allied to Ankara and opposed to the Assad regime. For Erdogan the Russian raid was a sort of assault on a zone which has come to be regarded as an extension of Turkish territory. The same zone, according to Erdogan’s imperialist project, has already been earmarked as a demilitarised ‘safe zone’, which will eventually be used to receive Syrian refugees under the control of Ankara which in turn, is supposed to eliminate the migrant problem as well as allow it to take over the area once Assad’s enemy regime falls. This would secure Turkey a piece of Syrian territory: valuable from both a strategic and economic stand point, including nipping in the bud a possible Kurdish statelet which would be a launchpad for its PKK/PYD enemies. While the Ankara government vigorously pursues its aim of eliminating Assad, enemy number one; enemy number two ­– Moscow – has entered the fray intent on saving him at all cost, war included, alongside improbable allies such as the other Arab countries, some of which however continue to support IS; as well as France and the USA, who however have other aims and objectives. This is just one more reason to put Moscow and its military operations under pressure. In addition the area under bombardment is where the lucrative ‘clandestine’ oil traffic passes from the Syrian oil zone conquered by IS through Turkish territory to the great economic advantage of the jihadists of al Baghdadi as well as the aspiring “sultan”, Erdogan. Last but not least Erdogan’s fears are focussed on the recent agreements between Moscow and its other main enemy Iran (the supporter of Assad). The nuclear deal with the US and the consequent lifting of sanctions allows it to play a much more decisive role in the region than it has up until now. It goes without saying that the issue of whose airspace this took place in has got nothing to do with it. Turkey needed this “evil act” to reduce the role and change the attitude of Russia which in Ankara’s eyes, for the reasons we have outlined, represents a real danger which has to be removed even at the cost of creating an imperialist crisis on a global scale. Even if it also means renouncing the Turkish Stream agreement and other projects of economic cooperation amongst which is the building of a huge power station with Russian money and technology. For Erdogan the question of Russian intervention and its consequences seem more a life and death question and not just one of strategic priorities. At the moment the Russian response to the downing of the jet fighter has been relatively soft. Putin certainly won’t renounce his programme of support for Assad or, if Assad does eventually go, will try to ensure that this does not produce a government hostile to Moscow’s interests. Thus he won’t back down and won’t be intimidated by Erdogan’s provocations. Obama has for the moment also taken a soft line, managing to face both ways at once. He first defended Turkey, maintaining that the Erdogan Government had every right to defend its air space. Then he came out with a call for calm saying that Russia was a good ally in the fight against IS terrorism as long it fought Assad and not his opponents. Imperialism is capable of such comedies! Everyone is against an IS which they have done much to create and allowed to grow but in reality everyone is in it for their own strategic interests. The USA and France fight Assad to eliminate Russia from the Middle East, Russia is intervening to save Assad and its own role in the Mediterranean. Turkey is against Russia in order to reinforce its own anti-Assad position against Iran. To those who love to be alarmist and fear a third world war we can tell them that “a small world war” is already taking place. The imperialist actors are all on the stage. The interests are obvious, the fronts too, even if hidden by temporary alliances. Just how much Turkey’s serious provocation of Russian imperialism will become the accelerator of a serious international conflict it is too early to say. Certainly the crisis which they say is being overcome is still well rooted in the economic and financial structure of world capitalism and it is not only exacerbating conflicts which are taking place now, but even more tragic ones which will break out in the near future. It does not matter if these episodes of war are isolated in various strategic zones, like the spots on a leopard, or are more generalised. A capitalism in decline can produce only crises, unemployment, pauperisation and wars however they are fought, with the proletariat playing its usual role as cannon fodder. There is only one alternative: either the international proletariat takes up again the forgotten road to frontal struggle against capitalism, more difficult today than yesterday for sure but that does not make it any less worth fighting, or we will be forced to analyse more episodes akin to what has unfolded in Syria or some other part of the planet, which the criminal voracity of one or other imperialist interest produces with the only result being more victims of its unending barbarity.